Testing is crucial to prepare for a racing season. By midway through the first decade of the 21st century, a typical Formula 1 testing programme had become a major exercise in both manpower and logistics, with many teams using multiple test drivers to take a share of the burden away from the race drivers. Conscious of the spiralling costs, which invariably resulted in development work that was invisible and meaningless to fans, Formula 1 racing’s governing body began to impose increasingly stringent testing restrictions. 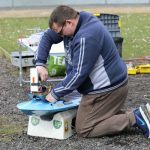 There’s no such restriction in model boat racing however, and the most successful racers will have tested extensively before the season starts, and do so continuously throughout the season. Importantly, this testing needs to be focused, evaluating one change at a time. We have seen racers run lap after lap of ‘testing’ with the only end result being more wear and tear on the boat and it’s components. We also see some racers making multiple alterations in one go and end up not being sure which change worked and which did not. Weather and water conditions play a major part in boat performance. In the UK, pre-season tests are typically done in outside temperatures of 10deg C or even less. This has a major impact on engine performance, often resulting in less than optimal combustion temperature in high nitro content fuelled boats. Thus, successful testing is mostly comparative by nature rather than measured on say outright speed. Endurance racing is all about lap time. The goal is to consistently produce low lap times. A boat that can corner quickly with little or no loading will generally beat the boat that has a couple of extra km/h down the straight but bogs in the corners. So you will typically start by trying to build a boat with low weight to achieve the highest power/weight ratio. You then perform comparative tests to determine the best gear ratio and propeller combination, together with fuel/air mixture, compression, tab settings and tuned pipe length. Gear Ratio – Endurance boats use reduction gearing to allow the engine to rev higher than the propeller. The purpose of this is to keep the engine in it’s peak power range providing the torque to turn larger propellers. Typically a 3.5cc boat gear ratio will be between 1.85:1 and 2.11:1. Testing with different gear ratios will determine the optimum balance of speed and corner pickup. 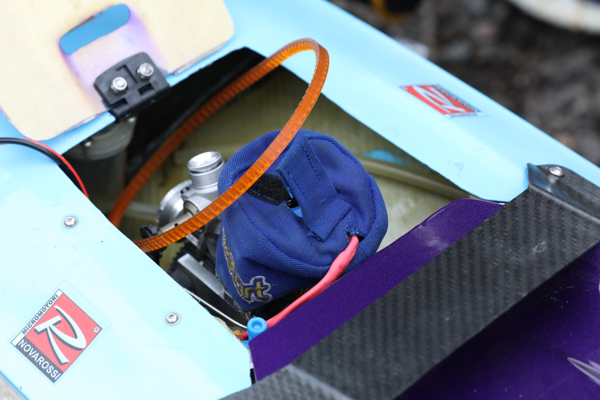 Pipe Length – Most competitive racers these days will have a radio-controlled pipe length adjuster. This mechanism allows the racer to shorten the pipe length on the straights and lengthen it for cornering. There are many ways to operate the pipe adjustment – Some will do this with channel mixing, others manually via a transmitter control. Depending on the sophistication of the RC equipment, it is possible to setup the adjuster so it lengthens instantly and shortens slowly, potentially improving pickup. It is important to simultaneously richen the fuel/air mixture when shortening the pipe or the motor may run too lean resulting in blown glow plugs or engine damage. Tuned pipe theory from Prestwich models. Propeller Size – Propeller performance has improved dramatically since the arrival of accurate CNC machined props that require no balancing. The prop is the easiest thing to change on a boat. The goal is to find the propeller that provides the best speed without any loading or unwanted torque effects which may upset the handling of the boat. It is not always the case that largest is best, but rather the largest that is suitable for a particular gear ratio. Trim tabs – Most top racers will have at least one trim tab on their boat. On a 3.5cc boat this will be a torque tab to counteract torque effects of the propeller. Some 15cc boats will have 3 tabs left, right and centre and sometimes these are controlled by a gyro that automatically generates servo inputs based on the pitch and roll characteristics of the model as it travels along the lake. Generally you won’t see 3 tabs in a 3.5cc boat as the weight penalty would probably outweigh any benefit, but 2 is common, the centre tab being used to raise or lower the nose of the boat. During testing, you may adjust the mixing of the tab(s) with throttle or rudder. Nitro content – A higher nitromethane content in your fuel will give you more torque, but depending on ambient and water temperature, high nitro can result in less than optimal combustion temperature. There is also a cost and availability element to it. 25% is probably considered average with up to 40 or even 50% in the 3.5cc class at the extremes. Compression – The compression can be altered by adding or removing shims between the liner and head button. More compression is more power, but there will be a point where reliability is affected and breakages begin to occur. So in conclusion, there are many parameters and components a racer can change on his boat and it is by methodical one step at a time testing that optimal performance will be achieved.